↑ Google maps. "Location of Lahore Fort". Google maps. 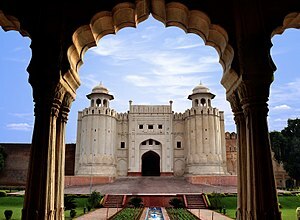 https://maps.google.com/maps?ie=UTF8&q=shahi+qila+lahore&fb=1&hq=lahore+fort&cid=3872470187115328748&hnear=&t=m&z=16&vpsrc=0&iwloc=A. Retrieved on 23 ستمبر 2013. ↑ Ruggles, D. Fairchild (2011). Islamic Gardens and Landscapes. University of Pennsylvania Press. ISBN 978-0-8122-0728-6. ↑ (1992) Islamic art in the Metropolitan Museum: The Historical Context. Metropolitan Museum of Art, 34. ↑ Punjab District Gazetteers, Volume 13. Controller of Print. and Stationery, 2002, 26. ↑ (2004) The Empire of the Great Mughals: History, Art and Culture. Reaktion Books, 352. ISBN 978-1-86189-185-3. ↑ Pashaura Singh (2006). Life and Work of Guru Arjan: History, Memory, and Biography in the Sikh Tradition. Oxford University Press, 23, 217–218. ISBN 978-0-19-567921-2. ↑ "The Fall of the Moghul Empire of Hindustan". Emotional Literacy. http://emotional-literacy-education.com/classic-books-online-a/tfmeh10.htm. Retrieved on 14 مئی 2015. ↑ Lahore-The Cultural Capital of Pakistan. Lulu, 18. ISBN 1-4583-2287-4. ↑ (2015) Remnants of the Sikh Empire: Historical Sikh Monuments in India & Pakistan. Hay House, Inc. ISBN 9384544930. ↑ Maharaja Ranjit Singh, the Last to Lay Arms. Abhinav Publications, 56. ISBN 9788170174103.